“I call heaven and earth as witnesses today against you, that I have set before you life and death, blessing and cursing; therefore choose life, that both you and your descendants may live” (Deuteronomy 30:19 NKJV). “Choose Life” = Spiritual Shorthand for the Busy Believer. What's one of the quickest ways to experience positive change in our lives? Choose life. How about for weight management, fitness and vibrant health? Yes, the “choose life” decision can be made in a minute and lived moment-by-moment one day at-a-time. Choose life. I have found these two simple, yet startlingly powerful words have kept me from falling prey to sudden urges for “just one” (bite, cookie, candy bar, soda, binge or foray into Debtsville). For me “just one” rarely ends with just one. Whenever I simply stop and say to myself, “I choose life,” my spirit (the real me) rises up with strength to overcome the flesh and I'm suddenly able to say “No” to temptation. These two potent little words from scripture can also help us get moving when our flesh wants to “veg out” or skip that day’s fitness commitment. “I choose life,” I'd say as I laced my running shoes and headed for the door or mini-trampoline. 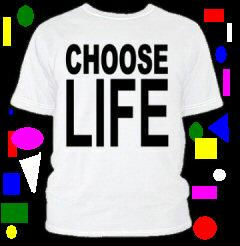 “Choose life” I'd say to myself when I wanted to “punish” my husband for hurting my feelings instead of forgiving him. “Choose life” would often turn the whole situation around. Jesus said His words are life. “The words that I speak to you are spirit, and they are life,” He said in John 6:63. We are presented with countless choices every day which affect the health and fitness of our spirit, soul and body. My flesh would cry, “I want it and I want it NOW!” I had to have my favorite snack, drink, a second helping. Like a child, the desire of the present moment took over. It didn't matter how strong my will power had been or how solid I thought my commitment was. My flesh would scream and I'd cave in like a startled soufflé. A third-party report (i.e. gossip) would come to me and I'd want to share the “news,” but then I'd hear the words in my heart, “Choose life” calling me to make a godly choice. To choose life is to choose God's way of doing things. Can we override the gentle nudge of the Spirit of God bringing His Word to our remembrance? Yes. The Lord's still, small voice doesn't come with a two-by-four to enforce compliance. While we may try “reasoning” or bargaining with the Lord, the more time we invest in reading, meditating and speaking His Word, the more we will want to heed His gentle reminder to “Choose LIFE,” the secret weapon for the Busy Believer.